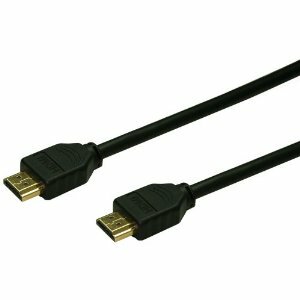 Do expensive HDMI cables matter? 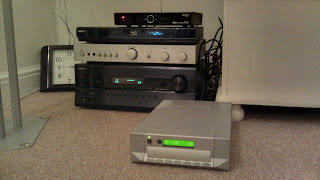 Having been on the hunt for a new CD player (yes some people still listen to CDs! ), I did the usual browse of hi-fi magazines and websites to help guide me towards what might be an improvement over my 18 year old Rotel. That said, it is becoming increasingly difficult to trust any review when some magazines describe a £300 HDMI cable as sounding 'controlled and composed'. This is a cable that carries a digital signal - digital meaning 1's and 0's. By that logic, a more expensive ethernet cable linking your personal computer to a network should also result in a more 'controlled and composed' internet experience. It won't. In the digital domain, the correct information is either received or it isn't. I have been unable to find any scientific evidence suggesting that a difference in picture quality can be detected between an HDMI cable costing £20 or £200. What I have found is a lot of anecdotal evidence from people who have invested in these cables. See cognitive dissonance and/or the placebo effect. Surely if a company wants to sell a cable for £200 - they would do well to demonstrate scientifically that it will deliver something? If hair conditioner costing a couple of pounds can manage that - surely an expensive HDMI cable can do the same. 'are immediately apparent, especially with sound quality. Dynamically, it's amongst the best HDMI cables around'. The same can be said about the way hi-fi journalists talk about equipment racks that 'serve up a muscular sound'. My hi-fi manages a similar sound...while sitting snugly on the floor. On the other hand, I am aware that there is a solid argument when it comes to investing in a decent cable that carries an analogue signal, which is more vulnerable to interference. Speaker cable is a good example. The real problem I have with these publications is that it is now almost impossible to trust any review. If they seriously believe that a digital cable costing hundreds of pounds can improve a image then presumably their judgement of everything else is also impaired. 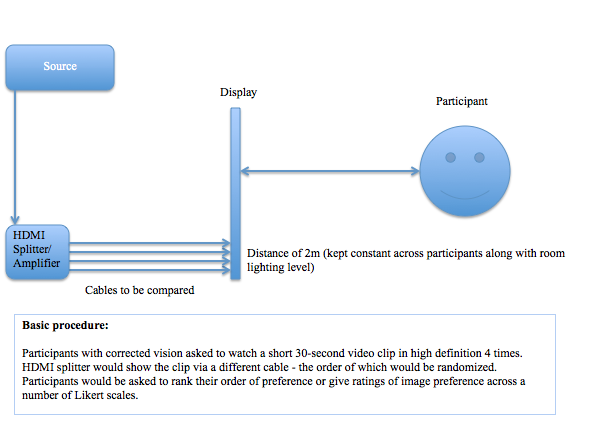 One obvious way to prove me wrong would be for a publication to run an experiment where cables are compared in a double blind study. But a hi-fi magazine will never do that for obvious reasons. *This is an untested hypothesis. Health and Safety: It's a funny old game. I recently attempted to take some exercise at my local gym and failed miserably. Not through injury or lack of motivation, but simply because I have not yet completed a gym induction programme. Prevented from using the treadmill, I was instead allowed to go for a swim (without any armbands)! The previous day I was also permitted to play squash in the same sports centre without any induction. So what carries more risk - squash or a treadmill? A quick literature search found one paper* that looked at hospital admissions relating to squash injuries in Victoria, Australia between 2000 and 2001. The authors found an overall injury rate of 35.5 injured players per 100,000. Over 90% of these patients were not admitted to hospital and discharged the same day. As for running on a treadmill, I couldn't find any meaningful numbers relating to hospital admissions based on running inside or outside. Using some common sense, running inside is likely to be safer than running outside because an individual doesn't have to worry about traffic or uneven terrain. When compared with squash, damage to the face and eyes seems unlikely. Injuries to the lower extremities might remain roughly the same as while a consistent pace over a longer duration may increase the risk of injury, the lack of sudden movements may mitigate this effect. Finally, squash carries the additional risk of colliding with an opponent. This doesn't seem likely on a treadmill. From a public health point of view this is really depressing. I imagine that a fair few people have occasional flashes of motivation along the lines of 'Today, I'm going to give up smoking!' or 'Right. Tomorrow I am going to get fit'. If not acted upon quickly, this motivation will quickly evaporate. Anyway, I have reluctantly booked my induction. Wish me luck!